Spring and Port Wine – LIVE! Bill Naughton’s period drama Spring and Port Wine is brought kicking and screaming into the 21st century thanks to a new adaptation as part of The Kings Arms’ ‘Mashed Up North’ festival. This story about a dominating father trying to control his increasingly wayward children whilst rebellion hangs is in the air may feel quaint and dated, but Naughton’s script is still engaging, if bizarrely relocated from 1960’s Bolton to 1989 Romania. The central core of the story is a refusal from youngest daughter Hilda to eat a herring for dinner. This refusal explodes the family and threatens their values. But with revolution in the air, do family values truly represent anything anymore? Derek Hicks as Rafe, the father of the house, is the highlight of the play. Hicks inspires both fear and sympathy from the audience, but provides a multi-layered and all the more real character thanks to the subtle layers of depth that he gives to Rafe. Rafe’s fear of being undermined and therefore weakened is well-handled by Hicks. Joan McGee’s Daisy is the flip-side of this, intelligent but not strong-willed enough to stand up to her husband. Her devotion is making her crack and McGee is convincingly conflicted between children and husband. I enjoyed the dynamic between the two actors, always referring to themselves in the third person by ‘Dad’ or ‘Mother’. All the Crompton family almost act brainwashed by fetching ‘Dad’ his coat/shoes/tea. It all makes for a pretty convincing portrayal of a family unit. You don’t know how ‘Dad’ will react to a certain discovery in the second half, and you know the company have got something right when there is a sharp intake of breath from the audience. Lily Shepherd is strong as the revolutionary Hilda, with her pivotal, and believable, refusal to eat a herring exploding the family’s issues out into the open. Similarly, Adam Bolton’s gives a strong performance as the uncouth and surly Harold. Chris Blinkhorn makes an impressive debut bringing the understated Wilfred to life as both Blinkhorn’s and Wilfred’s confidence boosts throughout the play. Mary Geraldine Hooton is stoically dignified as the devoted Florence, but Adam Vinten’s Arthur lacks depth and is a disappointingly wet flannel. Catia Perry perfectly pitches the irritating nosey neighbour Betsy Jane and provides many of the play’s lighter moments with natural humour. 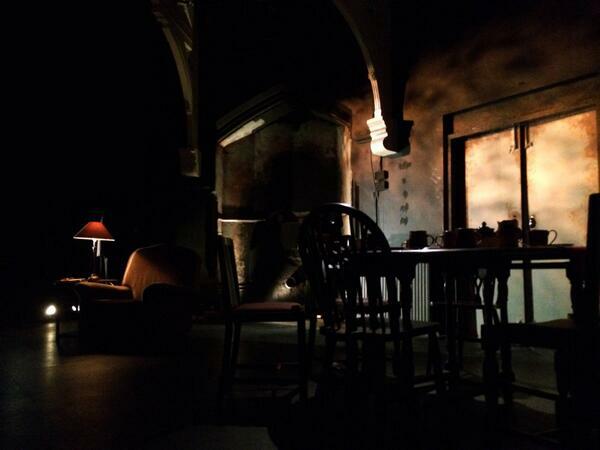 Aaron J Dootson’s lighting also subtly enhances the drama, dimming during scenes set around the dinner table whilst Kaylie Black’s design is impressive, showing off another facet of the changeling-like interior of the Kings’ theatre. Naughton’s script has moments of astonishing drama contrasted against meandering diversions. Much of the fairly slow first half exists only to build towards Rafe’s comeuppance in the second half. The decision to relocate the play is bizarre one, especially with precious little ambiance of Romania to be had. The characters retain Northern accents and dialogue making this a confusing mash up. But, if you can look past this, Spring and Port Wine is still a relevant and at times powerful story. Competently produced, and well-acted with an excellent central performance from Hicks, it’s a solid revival of a kitchen sink classic. Spring and Port Wine is part of the Mashed Up North Festival at Salford’s Kings Arms. Spring and Port Wine runs till Saturday 15 February with Victor Frankenstein continuing the festival on 19 February. ← Love on the Dole – LIVE!